Kids – What makes a good sandwich? It should taste yummy, it should fill us up to keep us going until our next meal and give us good stuff to keep us healthy. 1 First you need some bread. Do you always have boring white bread? Try something different. Wraps, pitta, rolls, bagels, brown, seeded, wholemeal, ‘best of both’ or added fibre – can you think of any other kinds of bread? Bread that has seeds and oats, is brown, wholemeal or granary, or has added fibre all give us more fibre. Lots of people don’t eat enough fibre. Sandwiches are a good way to get more if we choose the right bread (and get some veggies or houmous inside them). What does fibre do? Fibre keeps our insides healthy. 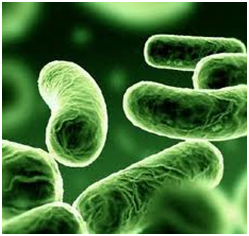 Did you know that you have millions of bacteria living inside your tummy and they keep you healthy? Fibre keeps them happy and helps stop you getting tummy bugs. Friendly bugs that live inside your tummies!! Fibre keeps all the stuff going through you moving so that you have healthy poo and you can go to the toilet easily. Fibre helps to keep you feeling fuller longer and stop you feeling all tired and hungry while you are doing fun things. And if that wasn’t enough, some kinds of fibre help to keep our hearts healthy too. When you make your sandwich choose a new kind of bread or make a stripy sandwich – one slice white and one slice brown! Do you need butter or spread? You could use some low fat mayonnaise, low fat cream cheese or houmous instead of butter or spread. If you do need some butter, spread it thinly. Jam and chocolate spread are quite yummy but they are not fillings that are going to give you fuel for the day. It is good to have something that gives us lots of things that our body needs like protein and vitamins not just energy. Cheese, ham, tuna, houmous, chicken, egg, tinned salmon, roast beef – can you think of other fillings? 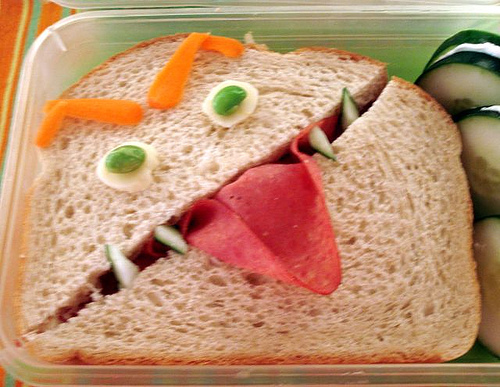 Try not to have the same filling every day if you take sandwiches in your lunchbox. 4 Add to your 5-a-day!! Could you have some vegetables or fruit in your sandwich? Crunchy things like cucumber, peppers, lettuce or juicy things like tomato slices or sliced apple (yummy with cheese). What other vegetables could you have? I like avocado. Have you ever tried avocado? It looks like a big, dark coloured knobbly pear on the outside and is all smooth and creamy green inside. If you don’t like vegetables inside your sandwich decorate your sandwich with them or have them on the side. Crunchy carrot sticks anyone? 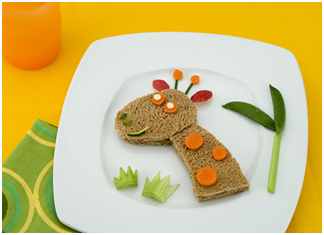 So make a healthy sandwich and make your sandwich look fun and yummy. This was written to help Beavers with their healthy eating badge…..